Order Your 2018 LLSA Study Guide Today! You'll Get Full Reprints* Of The Original Articles And Gain All The Knowledge You Need, Plus Earn Free CME. 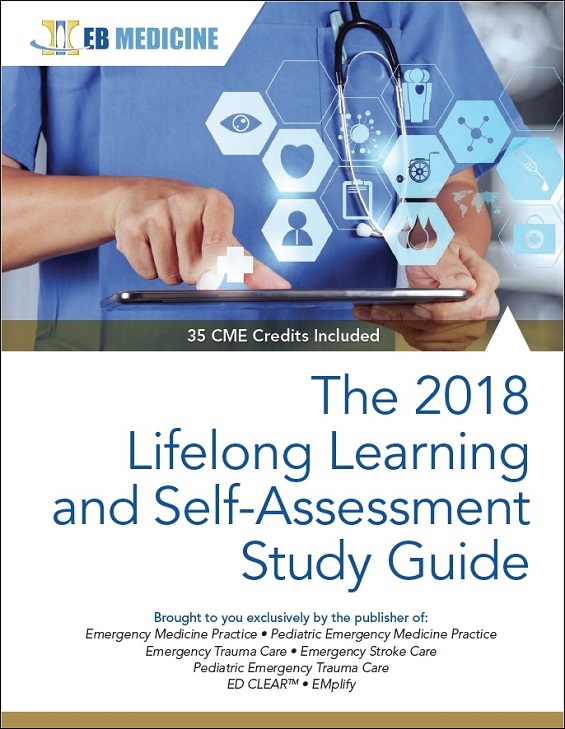 EB Medicine's 2018 LLSA Study Guide is designed specifically to help you gain practical knowledge of the material and to ace the ABEM exam. For each of the readings chosen by ABEM, you receive print and digital tools to help you ace the exam. Both versions include full reprints* of the articles, a summary and in-depth discussion of each article, sample questions and answers, and a critique of the article. Plus, you earn 35 AMA PRA Category 1 CreditsTM / ACEP Category I at no extra charge. If you are not satisfied for any reason, simply call us at any time to receive a full and immediate refund. No questions asked, and you keep the book and CME credits. The LLSA examination is one of the 3 components required for maintenance of certification (MOC) with the American Board of Emergency Medicine (ABEM). The primary goal of the LLSA examination is to promote continuous learning by diplomates. ABEM facilitates this learning by identifying an annual set of LLSA readings to guide diplomates in self-study of recent EM literature. Readings are intended to address issues relevant to current clinical practice. This study guide is created each year for emergency medicine physicians preparing for the ABEM examination required for maintenance of their certification. First time using the study guide, and appreciated the set up-good concise information prior to reading the articles, allowing you to get even more out of them! This is best choice, good quality and best LLSA I've seen! Thx. Very informative and good review of highly important information.